Damon (Distributed AOP Middleware on top of a p2p Overlay Network) is a fully distributed AOP middleware built on top of a structured peer-to-peer and dynamic AOP substrates. 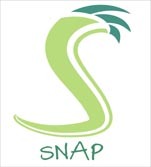 Its main aim is to provide the necessary abstractions and services to develop distributed aspects in large-scale scenarios. A decentralized aspect container: that provides the necessary infrastructure to launch and weave aspects in a decentralized and distributed way. Location and Discovery Services: supported by a p2p locator model. Underlying p2p functionalities: necessary abstraction layer for network and instrumentation services. Routing and Messaging : enables efficient routing mechanisms for remote services and creates a communication bus among the active distributed aspects. p2p Abstractions are a mapping from a set of large-scale communication services, like one-to-one and one-to-many, into our distributed model. Current abstractions are "direct", "hopped", "any", "many", and "multi" ones. Persistence : allows distributed aspects to store and retrieve information from/to the network. Reflective : that benefits from the instrumentation layer of the host and the network data. p2p Overlay Layer : provided by EasyPastry project. Source Hooks provide abstract connection between local interception and remote services. Remote Connections provide remote pointcuts and advices, and remote methods and invocations mechanisms. Distributed Meta-Aspect : which allows transparent composition of the aspect remoting service of other distributed aspects. Remote Meta-Pointcut is a new mechanism that performs the remote interception by specifying a remote service. Moreover, this interception can occur in different moments of the remote service execution : "Before", "Around", and "After"
Remote Meta-Advice another new mechanism that performs remote invocation of remote services transparently. Gérald Oster, Rubén Mondéjar, Pascal Molli, and Sergiu Dumitriu. Building a Collaborative Peer-to-Peer Wiki System on a Structured Overlay. Elsevier Computer Networks. Vol. 54, No. 12, June 2010, pp. 1939 - 1952. ISSN: 1389-1286. Gérald Oster, Pascal Molli, Sergiu Dumitriu, and Ruben Mondejar. UniWiki: A Collaborative P2P System for Distributed Wiki Applications. Accepted on the 19th IEEE International Workshops on Enabling Technologies: Infrastructures for Collaborative Enterprises (WETICE-2009). Groningen, Netherlands, June-July 2009. Rubén Mondéjar, Pedro García, Carles Pairot, Pascal Urso, and Pascal Molli. Designing a Distributed AOP Runtime Composition Model. Accepted for publication on to the 24th Annual ACM Symposium on Applied Computing (SAC 2009), Honolulu, Hawaii (USA). March 2009. Gérald Oster, Pascal Molli, Sergiu Dumitriu, and Ruben Mondejar. 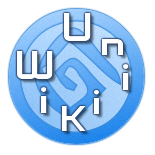 UniWiki: A Reliable and Scalable Peer-to-Peer System for Distributing Wiki Applications. Research Report RR-6848, LORIA -- INRIA Nancy Grand Est (France), February 2009. Rubén Mondéjar, Pedro García, Carles Pairot and Antonio F. Gómez Skarmeta. 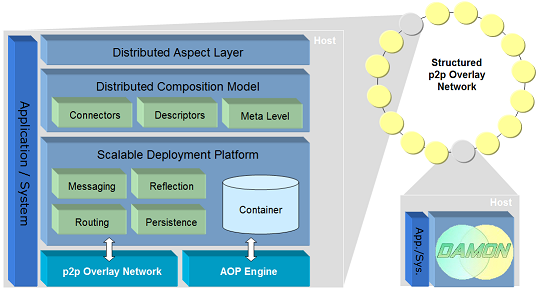 Building a Distributed AOP Middleware for Large Scale Systems. Accepted for publication on 7th International Conference on Aspect-Oriented Software Development (AOSD 2008), Next Generation Aspect Oriented Middleware Workshop (NAOMI 2008). Brussels, Belgium, March - April 2008. ACM ISBN: 978-1-60558-148-4/08/04. Rubén Mondéjar, Pedro García, Carles Pairot and Antonio F. Gómez Skarmeta. Adaptive Peer-to-Peer Web Clustering using Distributed Aspect Middleware (Damon). Accepted for publication on the 7th International Conference on Web Engineering (ICWE’07). Workshop on on Adaptation and Evolution in Web Systems Engineering (AEWSE'07). Como, Italy, July 2007. CEUR Workshop Proceedings, ISSN 1613-0073.